Monster Energy Kawasaki’s Ryan Villopoto and Red Bull KTM’s Ken Roczen started the year off with a bang with 1-1 scores at the Lucas Oil Pro Motocross Championship, but their competitors have begun to make inroads on them through the last few rounds. 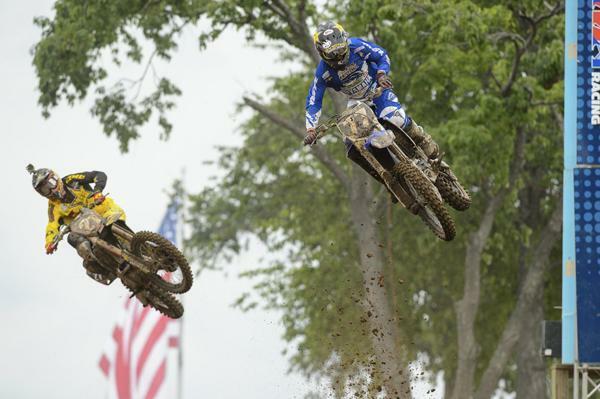 As the second half kicks off, they answered back with overall wins at the Red Bull RedBud National in front of the typically-massive Michigan crowd. For Roczen, the battle for 250 supremacy will wage on, as GEICO Honda’s Eli Tomac was still darned fast all day and earned second overall, tying Roczen on points for the day and leaving with second overall. But the 450 class now features a totally different picture, with Villopoto profiting in more ways than one. Josh Grant secured the Motorcycle-Superstore.com holeshot in 450 moto one. Grant would hold Ryan Villopoto, James Stewart and Ryan Dungey for a few laps before finishing the moto in third. Ryan Villopoto didnt get a good start in moto one, but he made a strong charge to the front, picking off Dungey, Canard and Grant to get the lead. 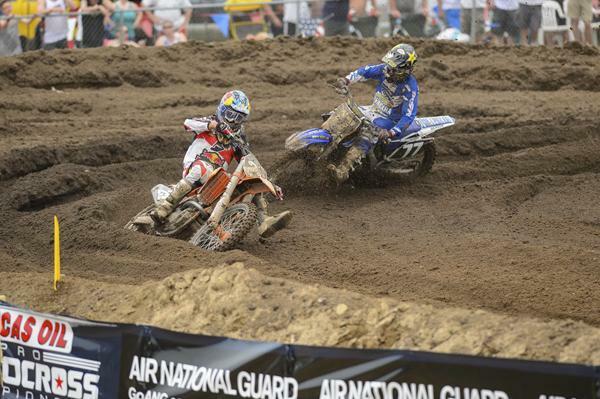 Dungey also got around Canard and Grant and was running in second when he stalled his bike and could not restart it. 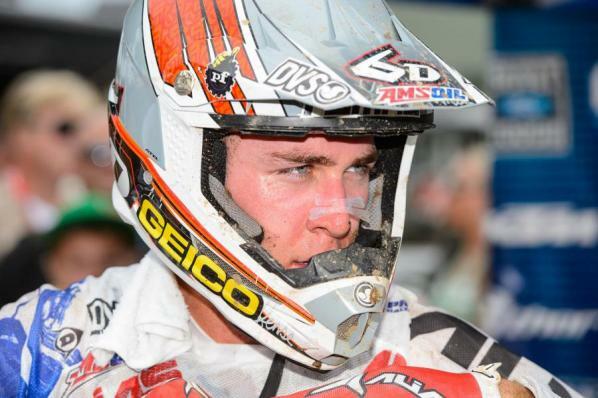 His DNF left him credited with 34th in the moto. James Stewart came through the pack in moto one to grab a spot inside the top three, and then inherited second when Ryan Dungey's bike broke. 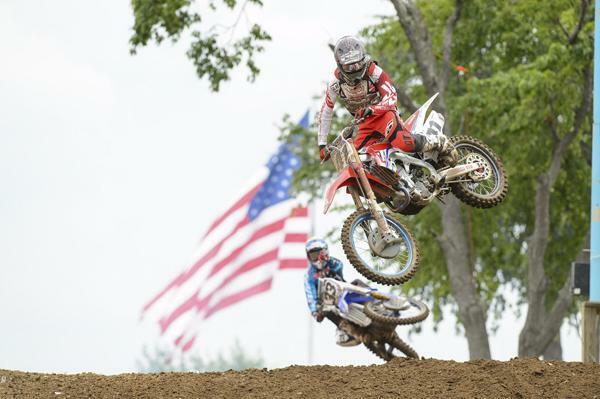 Justin Barcia came from outside the top thirty in moto one to finish ninth. He was down in the first turn. 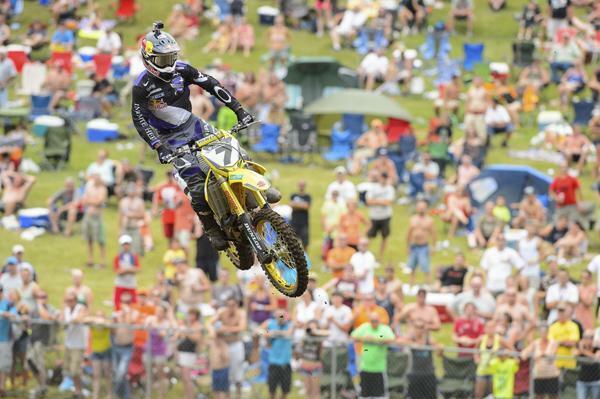 James Stewart grabbed the holeshot in the second moto, and led Dungey and Villopoto for the first part of the moto. 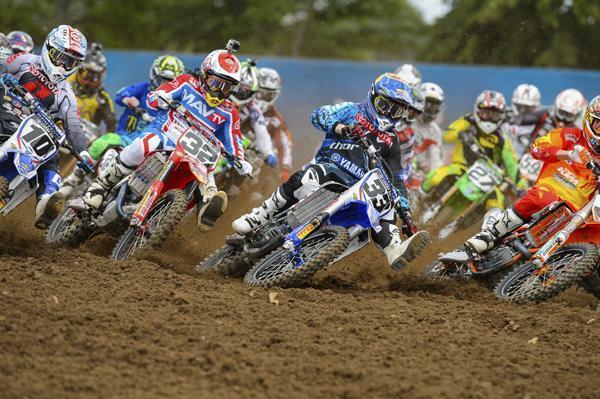 Villopoto got to second and started pressing Stewart, but Stewart held his ground. At one point, they even touched, and Villopoto went off the track. 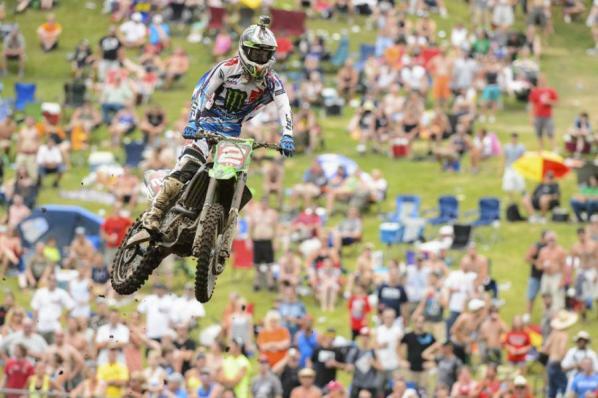 He recovered to put the pressure back on, and when Stewart made a mistake, Villopoto took over the lead. 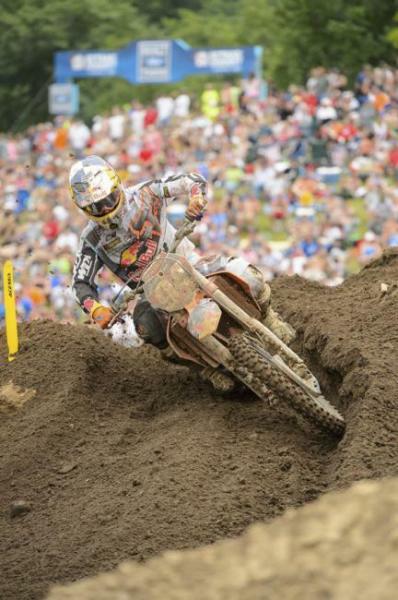 Dungey had a horrible gate pick after his 34th in moto one, but still managed to get a good start. He was passed by Villopoto early, but then found his stride and got around Stewart, and then pressed Villopoto for the lead. The Ryans were close down the stretch, but then Dungey suffered a big crash late, which knocked him back behind Stewart for third place. 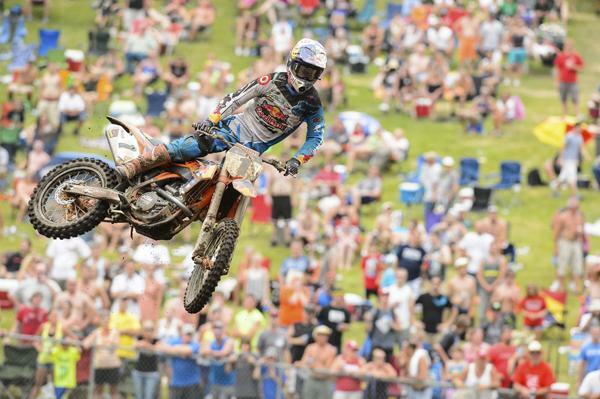 Combined with his first-moto DNF, Dungey finished 11th overall on the day. Villopoto fended off a valiant challenge from Dungey in the second moto to finish off the day with a 1-1 sweep. 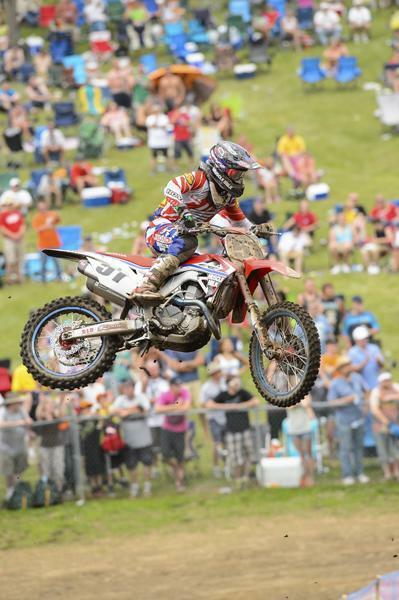 Grant finished fifth in the second moto and third overall on the day, his first podium since Steel City last year. 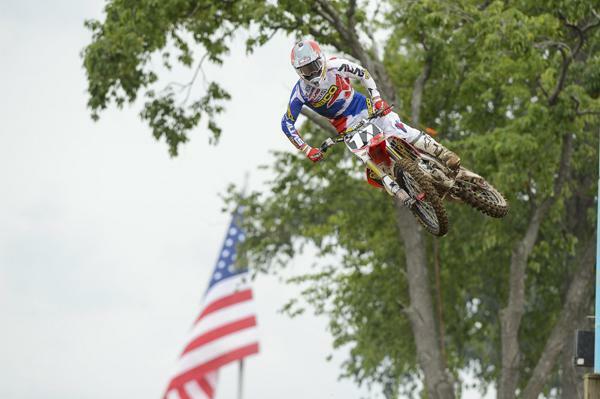 Trey Canard was solid all day en route to fourth overall on the day via 5-6 moto scores. In the first 250 moto of the day, Wil Hahn (19) would secure his fourth Motorcycle-Superstore.com holeshot on the season. 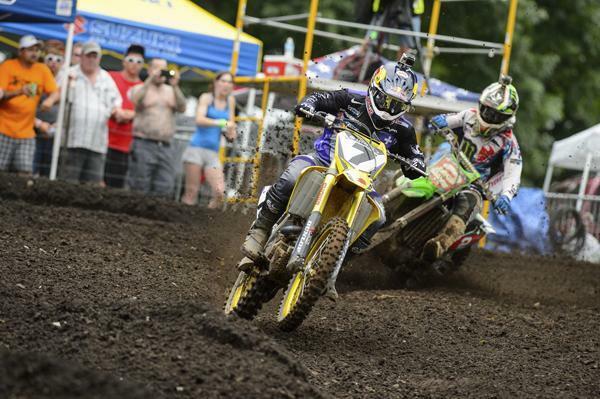 That's four holeshots in his first four gate drops this summer! Eli Tomac quickly took over the lead from Hahn, leaving the Red Bull KTM duo to fight for second as he cruised to the moto win. Roczen and Musquin got around Hahn, and were locked at the hip for much of the first 250 moto. 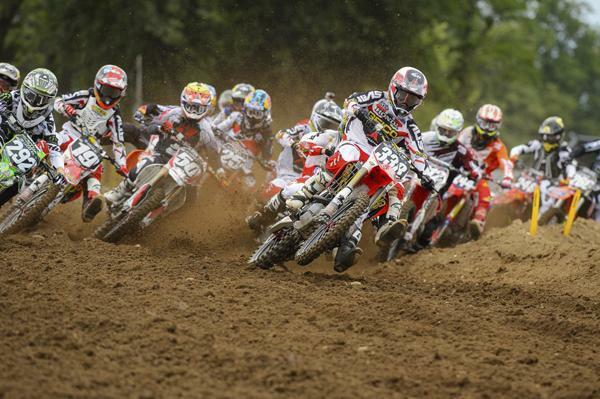 Roczen eventually made the pass on his teammate for second. MyPlash/Star Racing Yamaha rookie Jeremy Martin finished a career best fourth in the first moto, and even started pressuring Musquin late in the race. 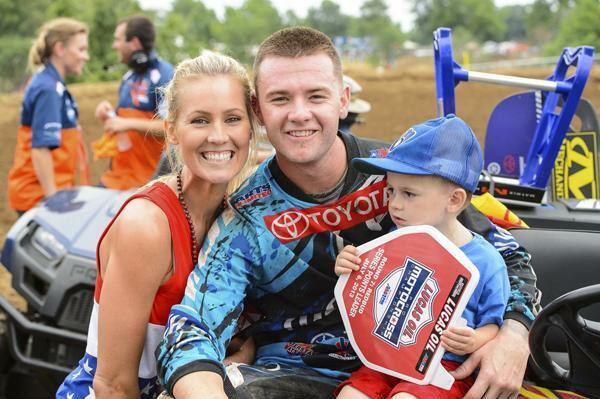 Jason Anderson, meanwhile, was running strong in moto one until broke spokes ended his race. GEICO Honda's Zach Osborne grabbed the holeshot in the second moto and lead briefly before sliding back to fifth in the moto. Roczen was aggressive early in the moto, quickly passing Osborne and Martin to take the early lead away. 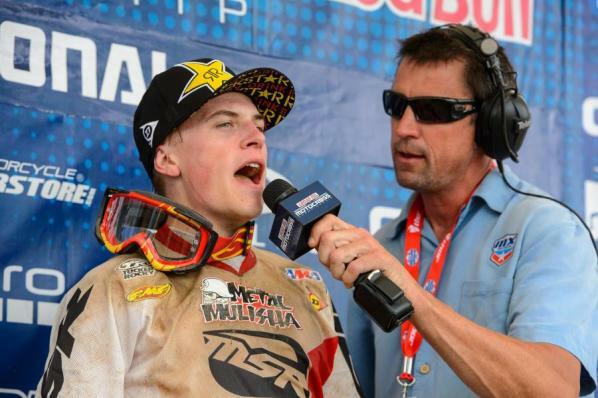 Tomac followed suit and got to second, setting up the Roczen/Tomac battle everyone is waiting for. But moments after taking second from his teammate, Osborne, Tomac crashed, and Osborne had nowhere to go and ran into him. 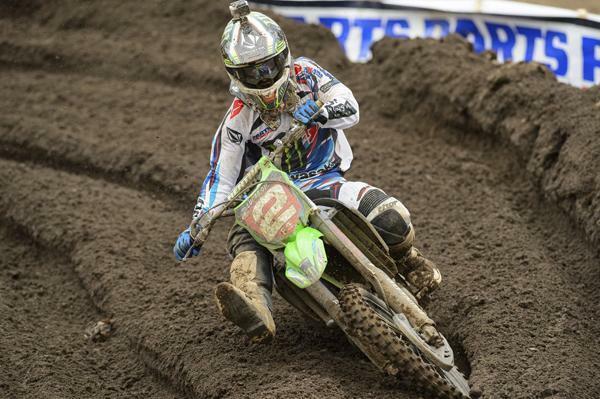 Tomac would remount in ninth. 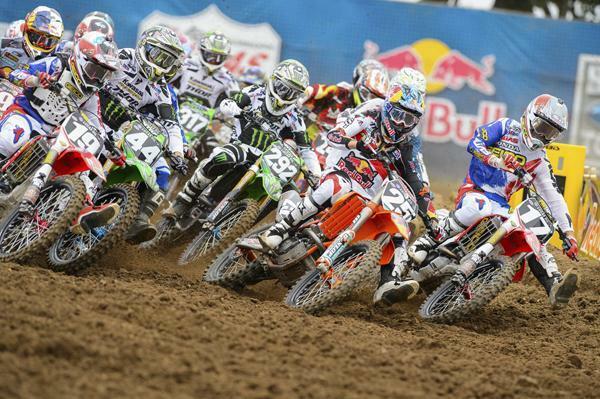 After Tomac fell back to ninth, the KTM of Musquin and the Yamaha of Martin would battle for second. 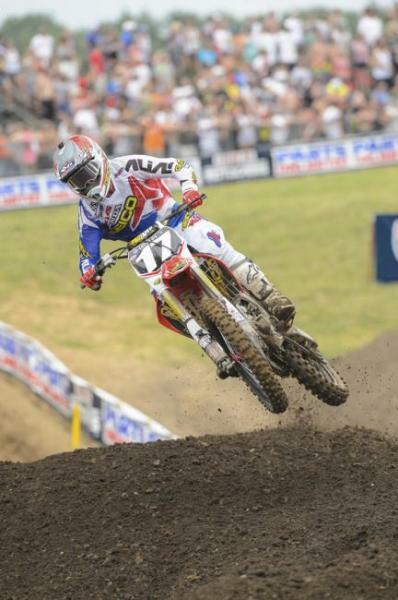 Tomac put on a blistering run to the front, throwing down lap times two to three seconds faster than his competition. Tomac eventually worked his way up to second, but would lose out on the overall. 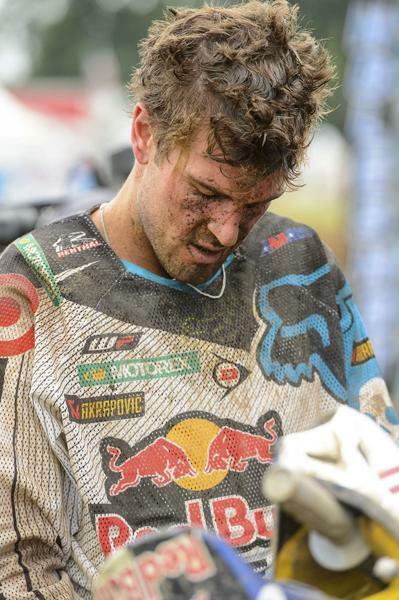 Musquin passed Martin at one point, but went down, putting Martin back in third for the moto. That gave him third overall, his first podium of the season. 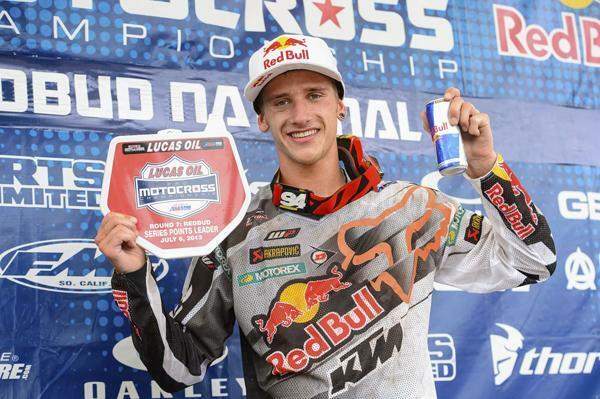 Roczen ran away from the field in the second moto en route to the overall via 2-1 scores. He and Tomac tied on points for the day, so Kenny retains the red plate.